Go Fit Girl! | Diet, health and fitness tips for average women. Site created and maintained by Ann Chihak Poff. Wow, It’s been months and months since I’ve written a post. There are definitely things I want to share with you all. Just time isn’t on my side these days. Twice a year I write about time change. And we are upon that time once again. For most of us in the U.S. we will Fall Back on Sunday at 2 a.m. Many of my readers are from Arizona, so this post doesn’t apply to you as much. (And note to my family, starting Sunday I will be an hour behind for about four months.) But I think the suggestions I am going to make are great whenever you cross time zones or as we move into the cooler and darker (and in Oregon, wetter) season. I am not a great sleeper. And time change for me is pretty difficult. When you Spring Forward, you lose an hour. The light is different. It is more difficult to get to bed on time for your workweek. When you Fall Back, you “gain” an hour. But that gain can still really mess you up. If you normally get up at 5 a.m. then you are likely gonna start rousing at 4 a.m. Ugh! And the evenings get darker earlier, which has already been happening lately. That “gained” hour can throw your day (or even the following week) off. There are ways to help your body adapt to time change, whether it is an hour (or several hours when traveling over time zones). I write about the time change when we Spring Forward and when we Fall Back. Don’t go to bed too late Saturday or Sunday night. Make sure you have breakfast Sunday and Monday morning (and every morning). Drink lots of water Sunday (but also today and tomorrow and always). Exercise. (I will be in yoga training all day Saturday and all day Sunday. I think we will have some time to practice actual yoga. If not, I’ll make sure to sneak at least a 10-15 minute practice in.) Even going for a walk can be helpful. Keep up the exercise throughout the week, especially on Monday. Find that motivation. It will be tough, but well worth it. If you do nap Saturday or Sunday (I love my weekend naps), don’t nap too late. Maybe instead of a nap, you practice 30 minutes of Restorative Yoga. If caffeine really affects you maybe cut back Sunday and definitely don’t have it too late in the day. Don’t drink too much alcohol, especially too late in the day/evening. Melatonin is a natural hormone found in our bodies. You can buy it over the counter to help with sleep. My doctor advised me at one point to try melatonin to help with my sleep issues. It helps me sleep. But I wouldn’t advise trying it for the first time Sunday night, especially the day before you have to go to work. Talk to your doctor about it. Try it a night before you don’t have to go to work. Try to start winding your day down an hour before you go to bed. If you normally go to bed around 10, then at 9 make sure you are done for the day and ready for Monday’s workday. I know it is hard for all of us, myself included, but no screen time an hour before bed. Do something relaxing for that hour: read a book, knit, lounge, take a bath. 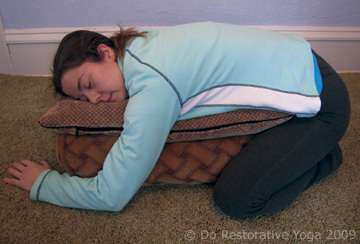 Even practice a Restorative Yoga pose or two. A few poses that can be beneficial are: Legs Up the Wall; Instant Maui; heart opener; and Savasana are just a few you can try. Hold these poses for at least 10 minutes (heart opener can be 5 minutes) each or longer. You can also try Supported Child’s Pose; Supported Twist. These poses can be held for 5-7 minutes. This video shows some poses. Practicing Viparita Kirani (Legs Up the Wall) is a great pose to practice when you need calm, to help with jet leg and insomnia, can help ease anxiety and slight depression. I wrote up a sequence sometime ago to curb sadness. It would also be great for time change or when you want a slower practice. I feel refreshed and amazing after practicing this sequence. The sequence I am teaching my students and am practicing in my home practice this week is slower, more mindful and calming. Some of the poses we are practicing are inversions, which are poses where your head is below your heart, such as Adho Mukha Svanasana (Downward Facing Dog), Uttanasana (Forward Fold), Prasarita Uttanasana (Wide-Legged Forward Fold), Setu Bandha (Bridge Pose). We are also practicing Viparita Karani (Legs Up the Wall Pose–pictured above), which is great for insomnia, jet lag, anxiety, mild depression, etc. To find out more, read here. Happy sleep and awake this week, next week and always! At the end of my yoga teacher training in May 2014 we did an exercise in class where we pretended like we were all getting together a year later for a reunion. We talked about what we did. The idea was if we said it as if it did actually happen it would make it more real. We were advised to write a letter to ourselves to read in a year, which I did. I wrote to myself on May 9, 2014 with instructions on the envelope that I could open the letter on May 8, 2015 or later. I opened that letter May 8, 2015. I read the letter a year later (and wrote about it here) and wrote myself a second letter to be read on May 8, 2016 or later. I opened that letter last year and posted about it on May 9, 2016. I will reduce my yoga class teaching schedule to make it more manageable for me physically, mentally and emotionally. DONE. My schedule is ever changing and I continue to find the right balance for me. Starting soon I will be back to having two days off and plan to keep that. I will reduce my cycle classes I teach and become a student of cycle much more often–at least once a week. DONE. At the time I wrote this intention I was teaching five cycle classes a week. I was down to three classes at the end of 2016 and added a fourth in early 2017. By mid-May I will be back to three a week. Karma Yoga relationship/program established. I have done a little work/fundraising with Living Yoga. But still figuring out my Karma Yoga. GFG! and newsletter going strong. Blog has slowed down. But newsletter continues on a monthly basis. Private clients continue to grow, especially since I am teaching less. Private clients are more occasional. But there is opportunity to grow that. Office yoga continues. DONE and continues. Continue to be a student of yoga. DONE. Not as often as I would like. Start my RYT 300 teacher training. The TT I want to attend has not started up yet. When it does I plan to be there. Plan trip to Italy. DONE. Planned and getting ready to go later this month. Teaching workshops on props and Restorative Yoga. Half DONE. I taught a Restorative yoga workshop in December 2016. I plan to teach more Restorative workshops at the end of 2017 and a prop workshop early 2018. Will have earned my “E” in my E-RYT 200. DONE. The “E” represents experienced and that I have taught at least 1,000 hours of yoga. I hit that number during my special Christmas Day donation yoga class. And I wrote myself a new (the fourth) letter today and will read it in a year and see what has become, changed and grown. The yoga theme champion is … the psoas (pronounced so-as)! I am really surprised by this winner. I thought for sure it would be the neck. But I do think the psoas is pretty awesome. The psoas is one of the most important muscles in the body. It is a deep-seated muscle that originates at the front of the lumbar, runs along the inner surface of the pelvis and over the pubis to attach to the inner surface of the femur bone at the lesser trochanter. It is the biggest and strongest muscle of the hip flexors. It is the only muscle that bridges the torso with the legs. Psoas affects posture and helps to stabilize the spine. If it is out of balance it can contribute to low back pain and pelvic pain. I had 120 entries for Ann’s March Madness Repeats Final Four brackets. As I mentioned above, the psoas was the yoga theme champion (which means it will be a repeated sequence during May Muscle Goodness.) The neck and feet tied for second place. Desk jockey and blank (as in the bracket was left blank) tied for third. The Ducks got one “vote” as did Duke. Some of the brackets were returned to me with messages such as: Go Ducks! Go KU! (BLEH!) and Go Tarheels! Three students won Solace Fine & Espresso gift cards. One student won Rx Missionary Chocolates box. One student won a Hip Chicks Do Wine gift certificate and mini wine glass. And the grand prize went to one student, which was a private yoga class with me (or could be exchanged for two Yoga in the Park mini classes). All winners have been notified of their wining prize. All prizes came from locally- and female-owned Portland-metro area businesses. If you know of locally-owned and especially female-owned businesses in the Portland area, please let me know in the comments below or by e-mailing me at ann@gofitgirl.com. I had fun with the brackets. I’m sure I will come up with another fun drawing in the future for my students. Stay tuned. In a previous post I mentioned that I am fundraising for Living Yoga’s Yogathon. I will be fundraising for Living Yoga for all of April. I am also fundraising for Rose Haven. I will be walking on Mother’s Day with members of my Beaverton Huddle. 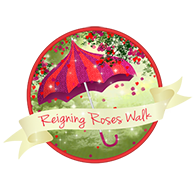 We will join hundreds of people for this Mother’s Day to honor the special women in our lives while raising funds to empower women and children of Rose Haven experiencing homelessness, abuse and other disruptive life events. Rose Haven fills a unique niche as one of the very few shelters available for women and children during the daytime, when they have nowhere else to go for safety and support. Rose Haven provides basic services that meet their immediate needs for safety, food, clothing, hygiene products, etc. They also offer support to help them address longer-term challenges related to employment, housing, medical and legal issues. You can donate to my fundraising page, directly to me (and I will get it to my fundraising page) or you can join my team and walk with us on Mother’s Day. My fundraising page for Rose Haven can be found here. Living Yoga is a nonprofit in Portland, which is changing lives by fostering healing and resilience in vulnerable and marginalized communities through trauma-informed yoga. Living Yoga brings trauma-informed yoga classes to prisons, youth centers, addiction facilities and to people in the community who would not otherwise have access to yoga. You can find my Living Yoga Yogathon fundraising page here. There will be two benefit classes at Turtles Yoga & Wellness in Beaverton this month. All proceeds will be donated to Living Yoga. Suggested donation for each class: $5-$10. My donation-based Hatha benefit class will have an emphasis on anatomy and alignment with a focus on celebrating Earth Day. The class will incorporate yoga poses, regulated breathing and meditation with a little fun and humor thrown in. All levels are supported and welcome. You can come to class and donate and/or you can go to my fundraising page, link above. You can also donate to Turtles’ fundraising page by clicking here. If you have questions or want more information about either fundraising opportunity or organization, feel free to e-mail me at ann@gofitgirl.com. I am participating in fundraising for Living Yoga’s Yogathon in the month of April. You can find my fundraising page here. I am teaching a benefit class at Turtles Yoga & Wellness this month. All proceeds will be donated to Living Yoga. If you have questions or want more information, feel free to e-mail me at ann@gofitgirl.com. Rose Haven doesn’t have a lot of space for donations. I will be donating some of their higher need can be used immediately items. Wednesday, March 8, is International Women’s Day. It’s also a protest/strike day: A Day Without A Woman. More information can be found here. A day for women to strike. I have given this day, this strike a lot of thought. If I were still in the corporate world I would absolutely take the day off without pay. But if I don’t teach (aka work) there are consequences. Simply put: If I don’t work I don’t get paid. And believe me, as a yoga teacher I need every penny I earn. And it isn’t fair to my students if I don’t teach. I teach two private office yoga classes on Wednesdays. My students have already paid me for these classes. So they would either not get yoga … but still pay for it … or not get yoga and I have to pay them back for that class. Neither option seems like a good idea to me. My third class on Wednesdays is a cycle class at a gym. I could get a sub. If I am not able to get a sub … I still have to teach. Plus the following Wednesday I have a sub in place as I will be going out of town. So I will be working but still observing this important day in other ways. I will be doing other things on Wednesday to support women. I will be supporting Rose Haven with my Beaverton Huddle to support other women who need help, love, kindness, compassion, understanding and just a helping hand. We stand up. We speak up. We follow up. Rights and equality for all. Women’s right are human rights. I am super excited to announce that I am partnering with Hip Chicks Do Wine for two wine and yoga events. Don’t worry, we’ll practice yoga first and enjoy wine after. Yoga before wine … you’ll be fine. There are two wine and yoga events planned for Saturdays, April 8 and May 6, from 1:45-4 p.m. Cost is $15 in advance/$18 at the door. Registration is from 1:45-2 p.m.; yoga from 2-3 p.m.; and from 3-4 p.m. we’ll taste four wines from Hip Chicks Do Wine. All levels of yoga are supported and welcome. Please wear comfortable clothing and bring a yoga mat. I anticipate these events selling out, so it would be a good idea to buy your tickets ahead of time. You can purchase your tickets on Hip Chick’s website. If you have any questions, feel free to e-mail winegoddess@hipchicksdowine.com or ann@gofitgirl.com. I mentioned in an earlier post about being part of a Beaverton Huddle. We met for the first time Thursday, Feb. 9 as part of the Women’s March 10 actions in the first 100 days. The idea of the Huddles all over the nation (and possibly the world) was to gather with others to define our next steps, and envision how to transform the energy we saw at Women’s Marches into local and national action. Many things and ideas were discussed. We talked about how we were feeling. And that we want to take some sort of action. It was a really beautiful and empowering experience. An amazing way to continue our work as peaceful and loving activists. Friday, Feb. 17 is The General National Strike Day, which calls for no work and no commerce. No work isn’t a possibility for me. As with some other women in my Beaverton Huddle group. So we came up with an idea to do good that day, whether you work or not. One of the women in the group works at the Disability, Aging and Veteran Services in Washington County, Oregon. We decided as a group to help resupply their pantry as supplies are low. Just some of the items that will be donated by me and some of friends/students. Items can be dropped off at Solace & Fine Espresso in Beaverton (4655 SW Griffith Drive) all day Friday, Feb. 17 (updated information from my previous post) as a bin will be provided. The bin will be attended from 6:30-8:30 p.m. I am really excited about this food pantry drive. When I was in the corporate world I ran the yearly food drive and toy drive for about seven years. I loved doing it. I felt good about myself, my company, our community, the organizations I worked with. If you are in the Beaverton area and want to participate there’s still time. If you want to host your own drive, do it. Or maybe you have passion for another organization that needs time, money or supplies. Organize something. Making the world a better place can be so easy. We can all just do a little something to make it brighter and better.